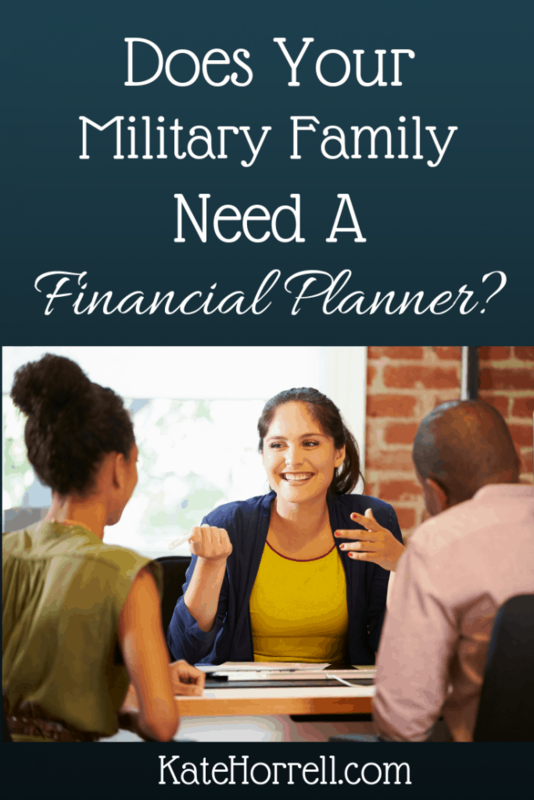 When Should A Military Member Hire A Financial Planner? I’ve been bugging my friend Forrest Baumhover to write this article for a long time. I’m glad he waited until he had the right thoughts in his head, because this is really good stuff. Not every military member should hire a financial planner. At least not one like me. Before I explain myself, I want to tell a little story about a recent client of mine. A retired Army colonel and his wife contacted me to write a one-time financial plan. As part of this plan, I meet with my clients twice. The first meeting, known as a discovery meeting, we usually meet after I’ve had a chance to look at their financial documents. That way I get to know a little more about them before I write my plan recommendations. For our discovery meeting, I met them at their house. He was on oxygen, and explained to me that he had cancer. And the prognosis wasn’t looking good. Even though he felt he had done a decent job managing their finances, he wanted a financial planner to help his wife when he was no longer able to do so. For most servicemembers and their families, the financial services you can get for free are pretty darn good. Regardless of which branch you’re in, most installations have offices with accredited financial counselors (AFCs) that will help with most significant money matters at no cost. While AFCs aren’t supposed to give specific investment advice outside of TSP, they’re going to solve most issues that come across your plate. And even when you feel like you’ve graduated from ‘financial counseling’ to ‘financial planning,’ what you can get for free is often good enough. Good enough to build objectively large amounts of wealth over a long period of time. The secret to long-term wealth is simple. Save more than you earn. Invest your extra money wisely. Protect yourself from the unknown. Spend your money only on what’s important to you. Do this for a very long time and maintain discipline in doing it. Your highest and best use of time is better spent doing something else. This happens to a lot of senior officers who transition into demanding executive positions. This also happens to a lot of people who feel they’ve worked hard for what they want, and they don’t want to spend ANY time on their finances. They simply want to outsource the heavy lifting to someone who can simplify their finances for them. Your financial situation becomes more complicated than what you feel you can handle. This also happens to a lot of senior officers, who end up with executive compensation packages, stock options, or other complicated matters. It also might happen to anyone with a complicated estate planning issue, like becoming the executor for a deceased family member’s estate or trust. But for the most part, it’s okay to be the tortoise. You don’t need to jump on a motorcycle to beat the hare. You just have to keep it simple, boring, and disciplined. So, when should you hire a financial planner? Organization: The first step to understanding your finances is to have everything organized in a way that is simple and easy to understand. A good financial planner will help you do this. Accountability: Many people are much more willing to take action on a task if they know they’re going to be asked about it. Think of the gym partner analogy—you’re less likely to blow off a workout if you know you’ve got someone depending on you to be there. Objectivity: Personal finance is more personal than finance. It can be difficult to take a step outside yourself to see what you could be doing better. A good financial planner can help you take time to appreciate the good decisions you’ve made, then focus on the next steps you still have to take. Proactivity: Have you heard the saying, “A task that’s scheduled always gets done?” The converse can be just as true. Things that don’t get scheduled never get done. Your financial planner should be reaching out between meetings on tasks you’ve agreed to. This could be to send you a note letting you know that an insurance quote you asked for came in. Or it could be to schedule a phone call to discuss something you had agreed to do in between appointments. Many clients appreciate when their planner is proactive in ensuring that things get done. Education: Many people make financial decisions based upon what they know. But then, they might learn that they made a mistake. Then, they might feel paralyzed because they’re afraid to make things worse. It becomes a cycle that is hard to break. Objectively speaking, taking the time to become educated is the best way to break this cycle. A good financial planner might realize this and help educate their clients about their unique situation so they can make more informed decisions. This is not the same as bombarding them with information, which only makes the problem worse. An educated client is one who will make better decisions, and stay the course when things look scary. Partnership: Making financial decisions can be daunting. At some point, there is no more analysis to be done. There are no more numbers to crunch. You can know what needs to be done, but still be too afraid to take that first step. That’s where it helps to have a partner, who has helped people in similar situations. If none of this resonates with you, then odds are you probably don’t need to hire a financial planner. Perhaps you could receive something of value from a planner, but it probably would not feel like a good partnership…for either of you. However, many happy clients would probably point to several (if not all) of these qualities as reasons they love their financial planner. Forrest Baumhover is the founder and principal of Westchase Financial Planning Inc., a fee-only financial planning practice in Tampa, FL. Throughout his career as a naval officer, his desire to help his fellow Sailors, friends and family members resolve their financial concerns has long been Forrest’s inspiration for starting a second career as a financial planner. Forrest is a Certified Financial Planner™ and is enrolled to practice in front of the Internal Revenue Service. Great article. The graduate phrase rings true. I tell people as a financial counselor that if they stick around with me long enough they will need or want a financial planner. I’m surprised he didn’t mention that a one time meeting with a planner can be valuable by getting a second opinion on a plan, particularly at times of transition. I haven’t engaged a planner yet, but this would be the reason I would do it. Good point! I have been wanting to talk to a planner, just to get another opinion on stuff. But I don’t trust anyone but friends, and I’m weird about sharing every last detail with my friends.